A typically schlocky outdoor adventure produced by Albert Broccoli, co-written by Richard Maibaum and shot by Ted Moore before they all hit gold with the Bond movies. 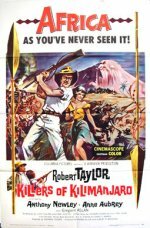 In Killers of Kilimanjaro, Robert Taylor, a pricey Hollywood import, plays an engineer who is building a railroad and looking for some missing persons who may or may not have been kidnapped. Lions and natives play the part of bad guys if this is regarded as an African western, which it is. Donald Pleasence can be spotted further down the cast.